Somali Islamist militant group al-Shabaab attacked DusitD2, an upscale hotel complex in the Nairobi, Kenya's capital city, killing at least one person and injuring several others, Reuters reported. Heavy shooting has resumed at the DusitD2 hotel complex, Reuters reported, citing witnesses. The media outlet also informed that eyewitnesses claimed some four bodies had been removed from a building near the site of the attack. 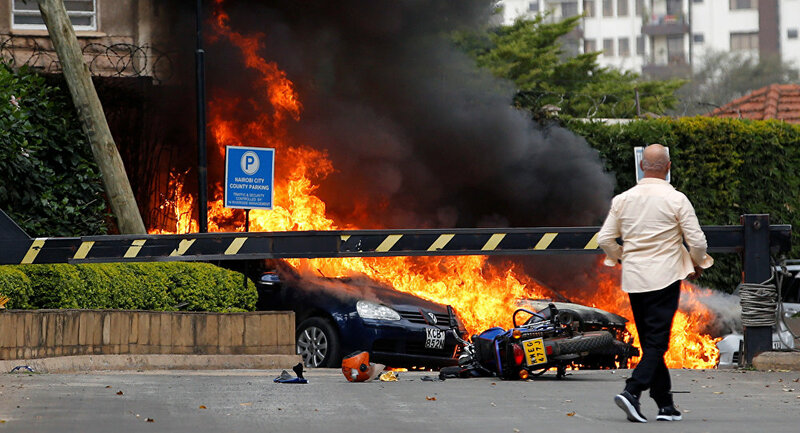 Speaking about the assault, Kenya police chief Joseph Boinnet specified that it had started with an explosion among the cars around the hotel and then continued with a suicide bomb in the building. "That (attack) began with an attack at I&M bank with an explosion that targeted three vehicles in the parking lot and a suicide bomb," he said, adding that the law enforcement had secured six floors out of seven at the hotel. Earlier in the day, the AP news agency reported about gunfire and explosions have been heard in an upscale hotel complex in the Nairobi, Kenya's capital city. According to The Star newspaper, at least three people have been killed and one more injured as a result of the attack on the DusitD2 hotel complex in Nairobi. However, the number of casualties in different reports varies: thus, Reuters stated, citing a hospital official, that one person has been killed and four others injured. As the officers at the scene stated, quoted by The Star, several people are being held hostage. "Several hostages have been held in Dusit hotel and we are waiting for back up," the law enforcement representative told the newspaper. According to Reuters, citing a local police chief, at least 21 people have been killed. A British man and an American man were reportedly among those killed in a militant attack in the Kenya capital. Later, Somali Islamist militant group al-Shabaab claimed responsibility for the assault, as their spokesman stated cited by Reuters. Shortly before that, a police spokesperson has stated, as quoted by CGTN Africa, that they are handling the incident as a terrorist attack. Speaking to local television, he also said they were not ruling out that it was a militant attack. "We have to go for the highest incident that could take place. The highest incident we have is a terror (attack)", Charles Owino told Citizen Television. Some social media users have shared alleged photos and videos of the incident. According to footage from the scene, several cars have been set on fire and gunshots are heard in the area. The blasts and gunfire took place at the DusitD2, a luxury hotel complex owned by a Thai multinational hospitality company frequently visited by holidaymakers, businessmen, and tourists. Meanwhile, renewed gunfire and blasts were heard early on Wednesday morning as authorities evacuated around 50 survivors of the attack on an upscale hotel and business complex, Reuters reported, citing a first responder. The local NTV news channel also reported an explosion shortly after an operation began to rescue people who are believed to be still trapped at the Dusit hotel in Nairobi. At least 15 people were reported dead and 30 wounded after militants stormed the luxury compound.